In 1924 it was merged with the New York Herald to form the New York Herald Tribune, which in turn ceased publication in 1966. Daguerrotype of the Tribune editorial staff by Mathew Brady, circa 1850s. 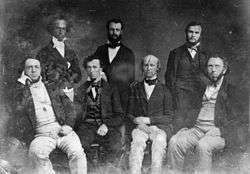 Horace Greeley is seated, second from the right. Legendary editor Charles Dana is standing, center. 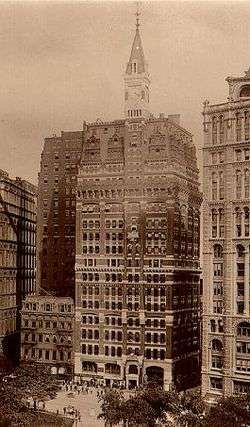 The New York Tribune building, today the site of One Pace Plaza. Tribune was created by Horace Greeley in 1841 with the goal of providing a straightforward, trustworthy media source in an era when newspapers such as the New York Sun and New York Herald thrived on sensationalism. Greeley had previously published a weekly newspaper, The New Yorker (unrelated to the modern magazine), in 1833, and was also publisher of the Whig Party's political organ, Log Cabin. 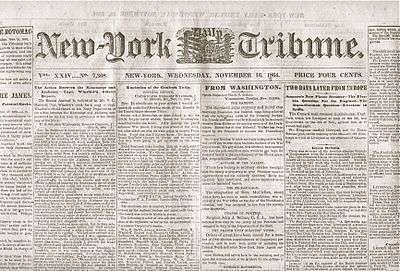 In 1841, he merged operations of these two publications into a new newspaper, the New-York Tribune. The Tribune did reflect some of Horace Greeley's idealist views. The journal retained Karl Marx as its London-based European correspondent in 1852. The arrangement provided Marx with much needed income during a period of his life in which his friend and collaborator Friedrich Engels could only provide limited financial support. The arrangement, whereby Engels also submitted articles under Marx's by-line, lasted ten years, with the final Marx column being published in February 1862. During Greeley's editorship, the paper was aided by able writers including Charles Anderson Dana, George William Curtis, William Henry Fry, Bayard Taylor, Margaret Fuller, George Ripley, Julius Chambers and Henry Jarvis Raymond. In 1854 the paper joined the newly formed Republican Party—Greeley chose the party's name—and emphasized opposition to slavery. During the American Civil War (1861–1865) the Tribune usually spoke for the Radical Republican faction that was very hostile to the Confederacy and wanted slavery abolished immediately. The paper generated a large readership, with a circulation of approximately 200,000 during the decade of the 1850s. This made the paper the largest circulation daily in New York City and perhaps in the entire United States — gaining commensurate influence among voters and political decision-makers in the process. During the first few months of the war, the paper's "on to Richmond" slogan pressured Union general Irvin McDowell into advancing on the Confederate capital of Richmond before his army was ready, resulting in the defeat at the First Battle of Manassas on July 21, 1861. After the failure of the Peninsular Campaign in the spring of 1862, the Tribune pressured President Abraham Lincoln into installing John Pope as commander of the Army of Virginia. During the 1863 Draft Riots a mob tried to burn down the Tribune building which lacked the Gatling guns of the nearby New York Times. Following Greeley's defeat by Ulysses S. Grant for the presidency of the United States in 1872, Whitelaw Reid assumed control of the Tribune. Greeley checked into Dr. Choate's Sanitarium where he died a few weeks later. In 1886, the Tribune became the first publication to be printed on a linotype machine, which allowed it to exceed the standard newspaper size of eight pages. Under Reid's son, Ogden Mills Reid, the paper acquired the New York Herald in 1924 to form the New York Herald Tribune, which continued to be run by Ogden M. Reid until his death in 1947. Copies of the New-York Tribune are available on microfilm at many large libraries and online at the Library of Congress. Also, indices from selected years in the late nineteenth century are available on the Library of Congress' website. The original paper articles from the newspaper's morgue are kept at The Center for American History at the University of Texas at Austin. The Tribune was referenced in one rendition of the popular 19th-century ballad, "No Irish Need Apply", as performed by Tony Pastor, as the paper of choice of the anti-Irish antagonist in the song. 1 2 Saul K. Padover, Karl Marx: An Intimate Biography. New York: McGraw-Hill, 1978; pg. 301. ↑ Padover, Karl Marx, pg. 605. ↑ Sandburg, Carl (1942). Storm Over the Land. Harcourt, Brace and Company. ↑ Padover, Karl Marx, pp. 301–302. ↑ "About New-York tribune. (New York [N.Y.]) 1866-1924," Library of Congress. "About New-York tribune. (New York [N.Y.]) 1866-1924". Chronicling America. Library of Congress. Retrieved February 20, 2011. Borchard, Gregory A. (2008). "New York Tribune". In Vaughn, Stephen L. Encyclopedia of American Journalism (1st ed.). Abingdon, UK: Routledge. pp. 343–345. ISBN 978-0-415-96950-5. Wikimedia Commons has media related to New York Tribune.